Recently I received both the highly awarded “Photosynthesis” game by Blue Orange Games AND their NEW “Planet” game which is launching this month for Earth Day! (fitting isn’t it?!) Admittedly we haven’t had as much time as I would like to play board games at our house so I was pretty blown out of the water by how educational and FUN these strategy games are! Plus with only 12 turns Planet takes about 30 minutes to play which we can really squeeze in any time! It’s a great quick game for use in schools as well as quick family game nights. What ages can play Planet? How many players can play Planet? As you can imagine, Planet is science based. Simply put you need to build your 3D (magnetic!) world and fill it with various habitats in an effort to not only win as many wildlife cards as you can but also to gain as many of a specific habitat as your card has designated. It’s really a two-fold strategy yet simple enough that kids can play it too! The game is geared for ages 8+ (2-4 players) and I think that’s a pretty good range for kids to play. My 9 and 11 year old boys had no problems at all catching on to this game! 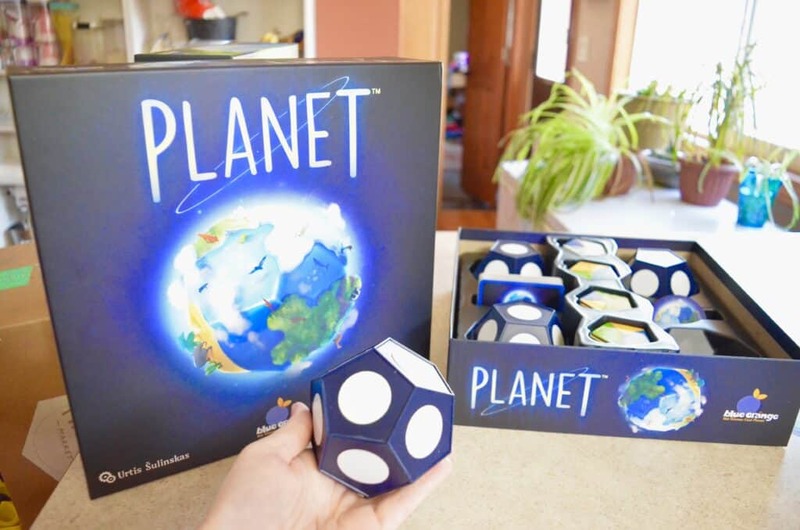 What does the Planet game include? What is the Goal of the Planet game? At the bottom of this post I’ve got a video tutorial that shows you how to play but I’ll give you the brief overview! Above you see the magnetic tiles with various habitats on them. 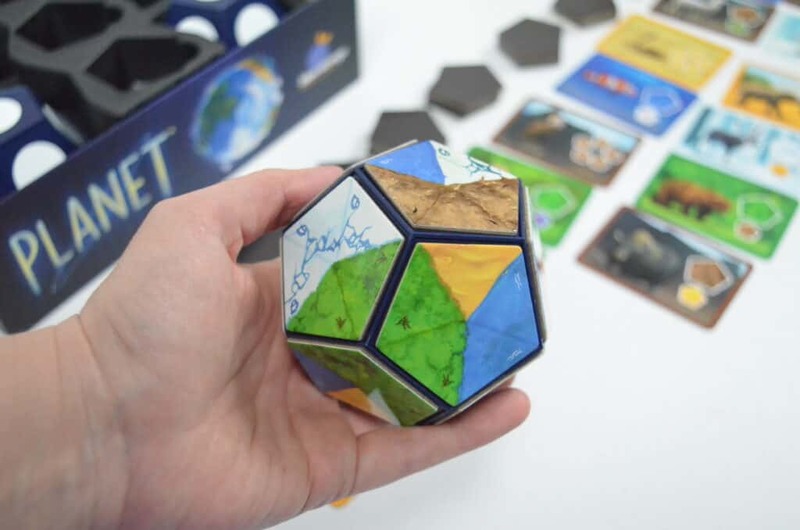 These magnetic pieces attach right to your planet core (easy peasy!). Every turn (well, almost every turn) you’ll get a chance to collect these tiles. You have TWO main objectives. Objective 1: Win as many animal wildlife cards as you can. Here’s an up close of the planet that I filled. The magnetic pieces snap on and hold on play firmly. I had no problems shaking my planet core around or losing pieces – the pieces are snugly held onto the planet core. 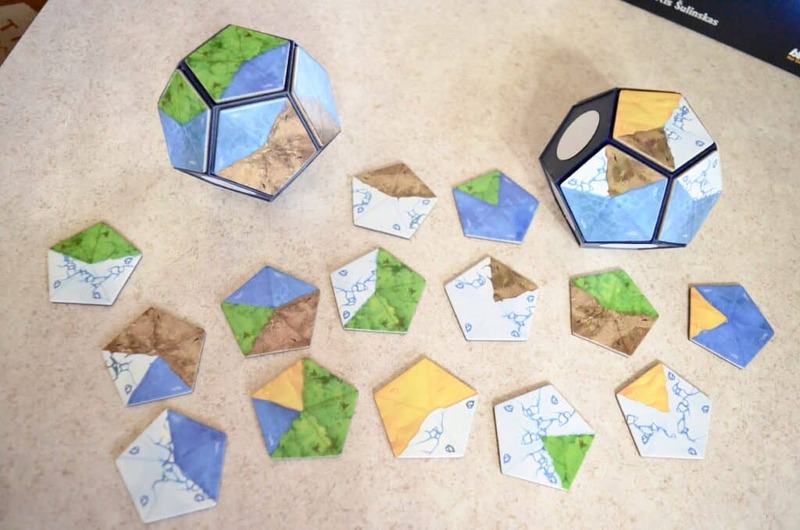 After the game you can easily remove all of your habitat tiles to count them and store away for the next game! 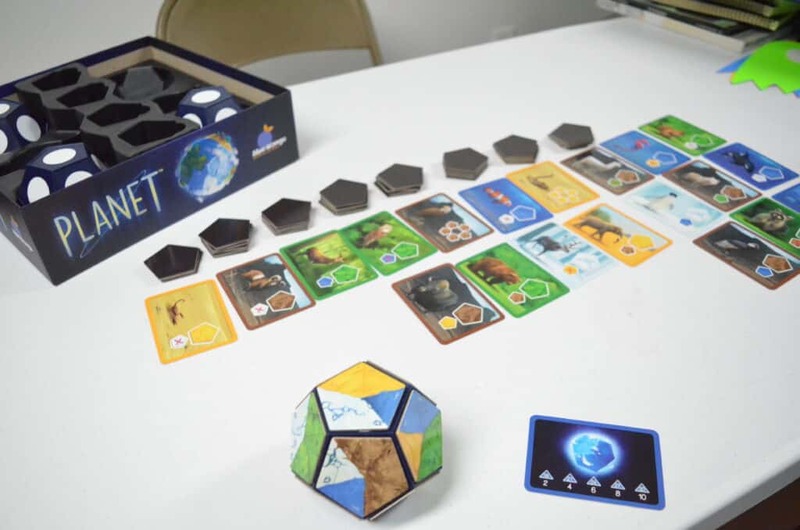 How do you set up the Planet board game? This is where keeping the illustrated guide on hand comes in handy! As mentioned, there are 12 turns for the entire game. Group your habitat magnetic tiles into 5 tiles in a pile and lay them in 10 piles on the table in a row. Each pile designates a “turn” in the game. Starting on the third pile (or 3rd turn), lay one wildlife animal card face up for all to see. Add one wildlife card each next to the 4th and 5th piles. 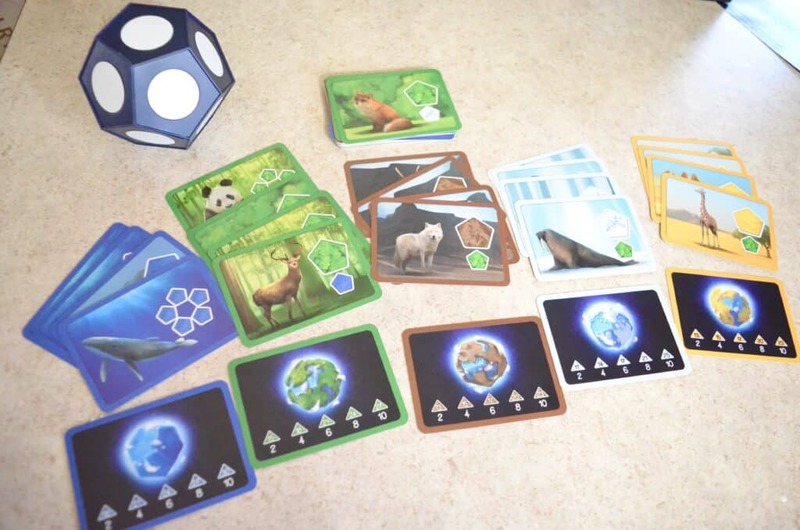 For turns 6-9 you’ll need to add TWO wildlife cards next to each magnetic habitat pile. For turn 10, add THREE wildlife cards next to the 10th magnetic pile. For turns 11 and 12 there are NO magnetic tiles, so simply lay 3 wildlife cards face up for each turn. Now you’re set up and ready to play! Each player should have one magnetic planet core and one habitat objective card. Begin on turns 1 and 2 by selecting a magnetic habitat tile and placing it on your planet core. Beginning on turn 3 you will have the option to both select a habitat tile AND the chance to win the wildlife card displayed. Whoever has the most of a specified habitat as displayed on the wildlife card will win that animal card! Continue moving through the game until you reach the end! You get TWO points for each animal card that is NOT the same as your habitat objective card. Count up the sections of habitat on your magnetic planet core that is the same as your objective card – you’ll receive points shown on your card based on how many tiles you have collected for that specific habitat. Whoever has the most points win! You can purchase Planet from Blue Orange Games or on Amazon!